If you are looking for swimming lessons for your school or company, then Happy Fish is the perfect swim school for you! We have experienced instructors who teach adults as well as kids. With proper guidance from them, we are confident that your students and employees will benefit from one of the most essential skills anyone should possess! We are aware that nowadays the school syllabus requires Swimming as a compulsory subject in the academic curriculum. At Happy Fish, we understand your need as an institute to provide the necessary training for your students. Therefore we’ve come up with a special program just for schools! With the experience of our certified Swimsafer instructors, your institute can count on us to provide the training that is required. Do not fret as we will take extra precautions in selecting an instructor to cater to your students. We understand that safety is your main priority and we can ensure that our instructors would be more than capable of handling that. Happy Fish believes that swimming is an essential skill for all. The earlier you pick up the skill, the better for you. Happy Fish offers a wide range of swimming lessons for various ages. 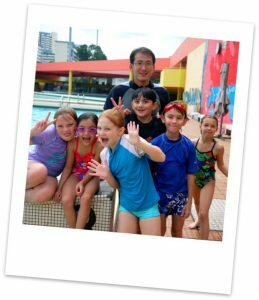 We provide swimming lessons from 5 years old onwards and according to the Singapore’s SwimSafer syllabus. We also provide competitive swimming lessons as well as lifesaving lessons. Should your institute be interested in our swimming lessons, please feel free to contact us for price quotations. Primary, Secondary, JC, Poly and ITE institutes are all welcome! Remember, there are no boundaries when it comes to swimming! A good company always provides job training for their employees. How is swimming related to work? Well, never underestimate how swimming can help your employees! By learning swimming together, they will have more time to interact, mingle and bond. By building good bonds with each other, employees will be able to work cohesively. Still not convince on how swimming can help to improve your company? Why not give it a try? If you never try, you’ll never know anyway. Happy Fish believes in equipping all Singaporeans with swimming skills no matter at what age. We want everyone to experience the joy of swimming. Furthermore, in this stressful working environment in Singapore, one should learn to relax, enjoy and de-stress from work at times. By learning to swim, it provides a balanced lifestyle of work and play for your employees. If you want better performing employees, then sign up with Happy Fish’s Corporate Swimming Lessons TODAY! Should you have any other enquiries, kindly feel free to contact us! Work as a company, swim as a company, advance as a company! How do you know about Happy Fish? Who recommend you about us?